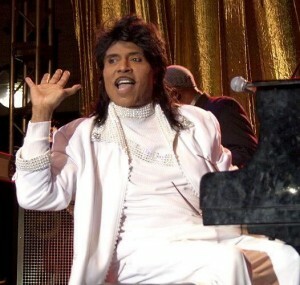 Little Richard is the greatest vocalist in rock and roll history. He is the man that was James Brown’s #1 influence, the man Paul McCartney copied, the man who first employed Jimi Hendrix, and the man that arguably started rock and roll with the second he let out his primal rock and roll roar for the first time. Little Richard had the voice of a super-being out of a comic book. His vocal chords were just blessed with the most perfect construction necessary to start a world wide revolution, and they did. Oh yea, he also played a mean piano as you can see in the glorious video below. Yea, this was an odd early 90s promo video for the John Goodman movie King Ralph, but God bless that movie for giving Little Richard another spotlight to elevate his classic hit “Good Golly Miss Molly,” to an absurd level of perfection. He just tears the roof off, proving that even at an advanced age, he hadn’t lost a lick of talent. Richard’s voice really was one of the most remarkable miracles in the history of music, and there is no one that can take away from him. Watch the hell out of this video below and just try to find someone with a better voice. It’s impossible.